It has been a looong time since I wrote any tutorials / sample codes. Recently a friend asked to create a simple base for a game where there is a character moving around randomly and upon tapping it, the character stops. So I created this tutorial for it. Initially I just wanted to put a ball as the character, but end up with a weird creature image. It is just an image with a transparent background anyway. If you are making a game instead of just animations, you should really consider using cocos2d. I have NEVER used cocos2d yet. I design my games from just using normal codings - coregraphics. If you plan to make graphic extensive game, then OpenGL is the only answer. Ok, to create this simple game, we need to declare some objects and some methods. 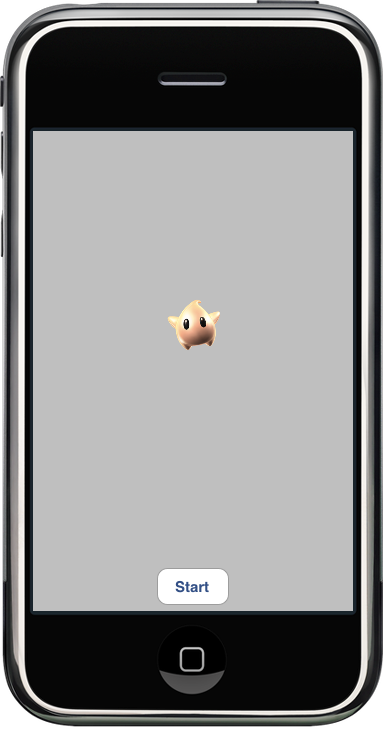 Obviously we need a UIImageView for the sprite. We also need a timer and a button. The moment the iOS runs the code up to the <-- arrow, myball already set to location (100,100) immediately even before it completes animating the movement. So this type of movement animation is useless for a game, because in a game you need to know exactly where the ball is at any instant. Thus we need to use NSTimer and move the UIImageView sprite step by step. And at each step, we will be able to check for collisions/touch location/and so on. Next we define the methods needed for this project. Then we need a few "Game Variables"
startButton.hidden = YES; // we don't want user to instantiate another timer, so hide the button after it has been tapped. // assign a random location within the view of size 320x480. // ask timer to execute moveBall repeatedly each 0.2 seconds. Execute the timer. Link this method to the Start button. When a user tap the start button, the button will dissappear, a new location destination for the sprite is given, the steps to take all the way to the new destination are calculated and then the move timer is fired up every 0.02 seconds. (the repeats: YES part tells the iOS to repeat calling the method moveBall forever). // xdist and ydist is to check the current distance of the sprite to the destination point. // enough to the destination, then it is time to give it a new destination. 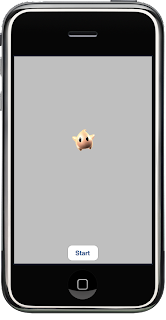 Now, we need to check when user touch the screen, and if user does touch it, check whether the touch intersect with the sprite or not, if it touched, then stop animation and show startButton. So the TouchesBegan delegate just to get the point of touch, and the check that point whether it intersects with the current location of the sprite. If it intersects, then we just stop the sprite from moving (Invalidate the timer, which will stop it), and show the startButton.